Sacramento perch (Archoplites interruptus), is the only native Western member of the sunfish family. The Sacramento perch is nolonger a common fish like it once was. It use to abound in the fresh waters of California's rivers and marshes. 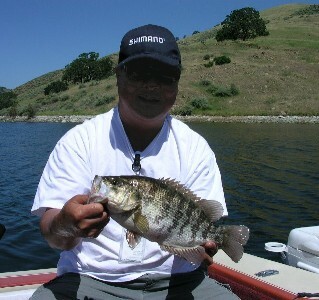 The introduction of non-native sunfish have put a serious crimp in the Sacramento perchs style. The non-native sunfish displace the sacramento perch because the sacramento perch doesn't guard its nest like the other sunfish do. Now the Sacramento perch is reduced to a few remaining waterways.